The premise: The MI team, while trying to prevent rogue terrorists (wait, aren’t they all rogue?)…. Let me rephrase. The MI team, while trying to prevent individual terrorists (as opposed to terrorist States) from sparking nuclear war, is intercepted by said individual terrorists who blow up part of the Kremlin. The upshot is that the Russians think the Americans did it. Ah, yes. We miss those Cold War days, don’t we? We were just so well matched: the Russkies and the Yanks. What a clever way to revive the old enmity–although the film is careful to say several times that there’s been a BIG mistake! “We are not enemies.” Are you listening, Mr. Putin? The MI team consists of Ethan Hunt (Tom Cruise), William Brandt (Jeremy Renner, whose acting falters a bit: too casual, too flip for the part), Jane Carter (a thoroughly believable, tough but feminine Paula Patton), and the Britt, Benji Dunn (Simon Pegg, who plays a hilarious, somewhat cowardly geek). The story is set in Budapest, Moscow, Dubai and Mumbai. The pacing is perfect. Perfect and seamless from the winsome prison bust that springs Ethan and his lovable oaf friend, Bogdan (Frank Sinatra is key to these scenes), to the heart-stopping human fly maneuvers Ethan must perform on the outside of the world’s tallest building, the Burj Khalifa, in Dubai. Nothing seems ridiculous or over the top in MIGP. There is a calm groundedness, humanity and humility pervading the excitement. And when Cruise explains it all to us with his intense, commanding presence, we just go with it. Women will love MIGP because of the LACK of gratuitous, mindless explosions and chases. There ARE explosions and chases (very cool ones, I might add, one involving the device of a sandstorm) but they make sense. I wouldn’t doubt that J. J. Abrams’ (Bad Robot Productions) genius may be at work here. Even when things get a little overblown (I’m no spoiler! ), you really won’t care because you’ve suspended your disbelief permanently in these expert filmmakers’ hands. And it’s funny! I mean, really funny. In all the right places. The agents fail a lot in MIGP. Things do not go smoothly at any point. Sometimes they lose nerve. They’re humans, not machines. This is such a welcome change in action movies! There’s an earnest underdog aura here. –The gadgets are cooler than Bond’s. –A lot of the fun is in the little details. –Um, I did not count one swear word. Not even “damn” or “hell.” And swearing would have been mighty appropriate in even one of these sticky situations. And the name of the Lord was not taken in vain! Whoop! (When good men lead—including in Hollywood—good things happen. Thanks, guys. I also think family men are more sensitive about these things—directors like Bird, Abrams, Nolan, Spielberg, etc.) Also, very little cleavage and gore. Pretty “family-friendly” action film. –Budapest, Moscow, Dubai, Mumbai: beautiful cities! –Best use of a car’s air bag in a film. Ever. –Too bad Oscar doesn’t care about action-thrillers. Sigh. 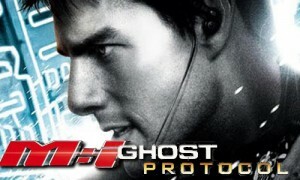 –Love the old-time Mission Impossible music, graphics and cinematography at the beginning…. –Catch the long dead silence scene. Awesome. –“Our media is no more truthful than yours.” –Russian to Tom Cruise. –Good cat fight with unexpected ending. –Is that how people park their cars in Mumbai? –Moreau looks like a 14-year-old baby doll assassin. –MIGP is devoid of snarky one-liners! MIGP is simply devoid of snark all together! Hip, hip hooray! –The amazing Brad Bird directs (who woulda thunk it? )—yes, Brad Bird of stellar animated films fame: (The Incredibles, Up, Ratatouille). I guess a good storyteller is a good storyteller is a good storyteller. –Agent Jane Carter actually takes off her high heels to run! What a concept! –Did anyone else think of Steve Jobs seeing Tom in the dark hoodie? –The end is lame and tame, opening the way for a sequel, but after such a sharp film, it could have been a little more snappy. Next Article Time to Simplify . . . Again!